Historically, schisms have been rather public, bloody things. This was clearly the case when the church split between East and West. Even though some hope of reconciliation was on the table at various points, excommunications had been traded, Crusades had happened, and everybody knew the two or three theological disputes that needed settling. Roughly the same thing could be said of the split between Protestants and Roman Catholics. Following a number of bloody wars, mutual persecutions, and martyrdoms, the results were different communions, confessional documents, and other marks of separation. 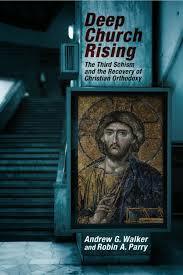 In their recent book Deep Church Rising: The Third Schism and the Recovery of Christian Orthodoxy, Andrew Walker and Robin Parry argue that, unbeknownst to many, the Western church is in the midst of a third great schism. Unlike the last two, though, the split hasn’t resulted in a clear line between new denominations and old ones, but runs right through the various churches of the West. On one side stand those who affirm a broadly supernaturalist Christian orthodoxy embodied in the Nicene and Chalcedonian Creeds. And on the other, you find those who can at best recite the creeds with their fingers crossed. Having embraced the various presuppositions of Enlightenment and postmodern thinking, they are skeptical of supernatural claims and often doubt the very idea of objective truth. Set against the backdrop of Western consumerism, our “secular age,” and evangelical tendencies toward thinner understandings of the church, Walker and Parry are worried about a widespread loss of the gospel within the Christian community. Taking a cue from C. S. Lewis, the authors propose a vision for recovering what they call “Deep Church,” meaning a thick orthodoxy of belief and practice woven together from the wisdom of our past. They want to help us recuperate from a bad case of “gospel amnesia” by renewing interest in the church’s historical journey. You can read the rest of my review at Christianity Today. Personally I’m praying that the Believers’ Church emphasis on the orthodoxy of the Bible becomes a viable third way in the midst of conservative (high orthodoxy of the creeds and early Christendom) versus progressive (non-orthodox social over spiritual) trends. This third way of post-Christendom Christianity does take seriously what can be learned from the history of the Church but finds a somewhat different wisdom after analysis. Does the book talk much about the filioque?